Sweet Twist of Blogging: A quick meet and sign. A quick meet and sign. So one of the benefits of working at food company with a food forum, entertaining/eating area and mock store front is that companies and schools will borrow this space for conferences or presentations. If we are lucky some of those companies/schools will bring in celebrity chefs and if we are even more lucky those celebrity chefs will take some time to meet and greet some employees of the building and even just maybe they might sign their cookbook for you. For this lucky moment I stood in line for almost an hour to get a signed cookbook and photo and although it was only 5 minutes It was GREAT! I was a bumbling idiot and couldn't think of anything decent to say other than I love your show but still great. He was just a genuine as on the show and yes very tall. Good Day. 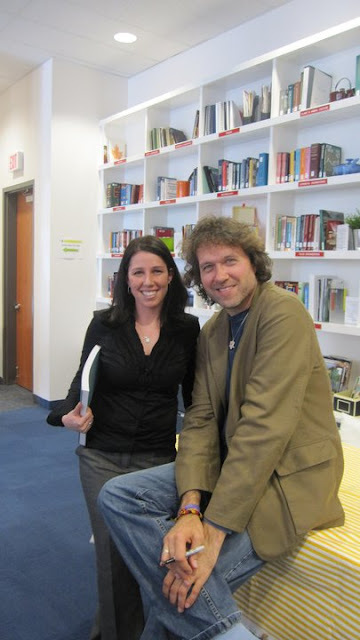 Me & my FIRST meeting with Michael Smith. Trust me, there will be more.